First responders selflessly give of themselves to protect us, and Jay Hoffacker, an ActioNet employee at the William J Hughes Technical Center, is one of them. Jay is a volunteer fire fighter with the West Tuckerton Fire Department. 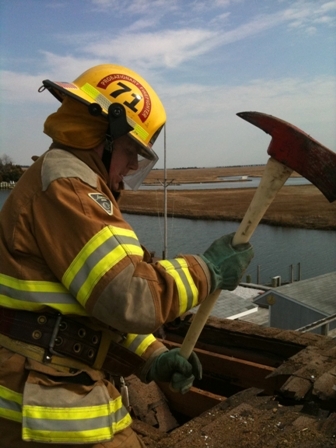 Most recently, Jay spent three nearly sleepless days putting out fires and rescuing the stranded residents of West Tuckerton and Mystic Islands as Hurricane Sandy ravaged the New Jersey Shoreline. 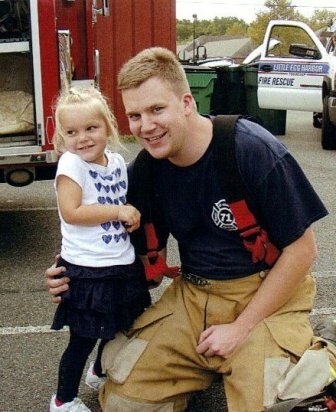 Even though Jay’s wife and two young children were home without power, Jay laid his life on the line to help those who were in even greater peril during the worst storm in NJ history. As a Hurricane Sandy first responder, Jay spent all day Sunday on a fire truck issuing a mandatory evacuation notification over the loudspeaker. When the storm hit, Jay and his fellow firefighters began rescue evacuations and fighting fires throughout West Tuckerton and Mystic Islands. Over the course of the next 3 days, Jay didn’t sleep beyond short catnaps in between nonstop fire and rescue calls. The majority of rescues were accomplished via firemen carrying trapped residents to and from a large two and a half ton truck. When necessary and possible, boats were used for rescues. At one point, Jay and his fellow firefighters were pulling water from a local lagoon to fight a fire as only the largest fire truck could make it through the deep water to battle the blaze. When it was all said and done, Jay was directly involved in between 50 and 60 rescues, along with three fires, which were extremely difficult to battle during the hurricane. Please join me in thanking Jay for his service and selflessness at a time when so many were depending on so few to save lives and homes along the NJ coastline.